The Highfive Admin Dashboard is your mission control for Highfive. This dashboard allows you to manage your account, users, and Highfive devices. Your ability to access the Highfive Admin Dashboard will depend on the Highfive service plan your company is on and your User Role. All users on the Essential plan (no longer offered) will be able to access the Admin Dashboard. For customers on all other services plans, only logged in Admin role users can access your company’s Admin Dashboard. Note: For companies with a .net, .org, .io, etc. top level domain, the dot "." will be replaced with a hyphen "-". Your Highfive Admin Dashboard will load and display your registered Highfive users as the home page. My Highfive dashboard won't load! Not sure if you're an Admin or not? You can contact any Highfive Admin in your organization to help check your current user role. 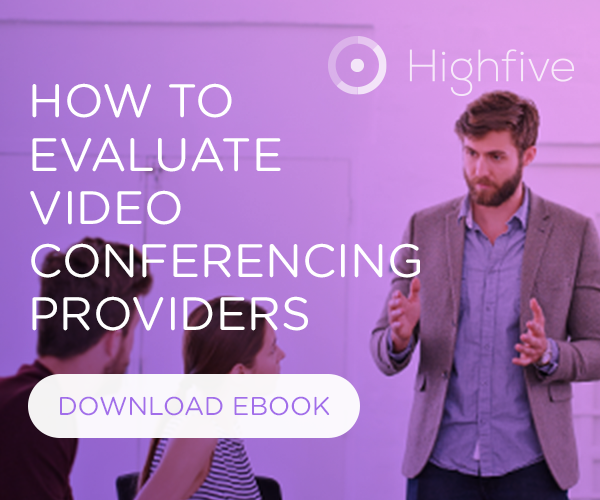 In most cases, this is the same individual that purchased or is deploying the Highfive video conferencing system for your organization. If the dashboard still fails to load, contact Highfive Support at help@highfive.com to report the issue. Download a .csv file that you can open with the spreadsheet application of your choice (i.e. Microsoft Excel). This file contains Highfive usage data, such as call names, participant names, start times, end times, etc. Invite team members to join Highfive. View and revoke your static dial-in phone number meeting codes. Click here for more information about Highfive Meeting Codes. Add participants to your call or start Highfive calls by sending meeting links via applications such as Slack. Configure single sign-on (SSO) with Highfive. Create, view, or update Highfive Support tickets that have been submitted by users at your company. Use the Search... box to look for keywords in tickets. Filter through different ticket states by selecting All. Create a new ticket by clicking New Ticket. Click on a support ticket to view and edit it.